One of my favourite RPGs are the ones that combine tactics with how you build a character – as seen in Final Fantasy Tactics and Tactics Ogre. 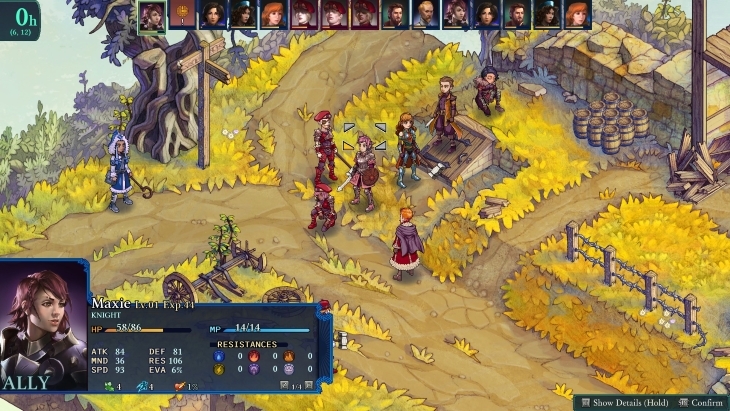 So when Fell Seal: Arbiter’s Mark came on my radar I was ecstatic at the chance to play it. While it heavily borrows from its Japanese forebears, the game is trying to present its own story, characters, and universe. Can it stand along-side its peers, or does it fall shy of the mark? After seven heroes saved the land of Teora they became Immortals and rulers, using Arbiters to carry out their will. 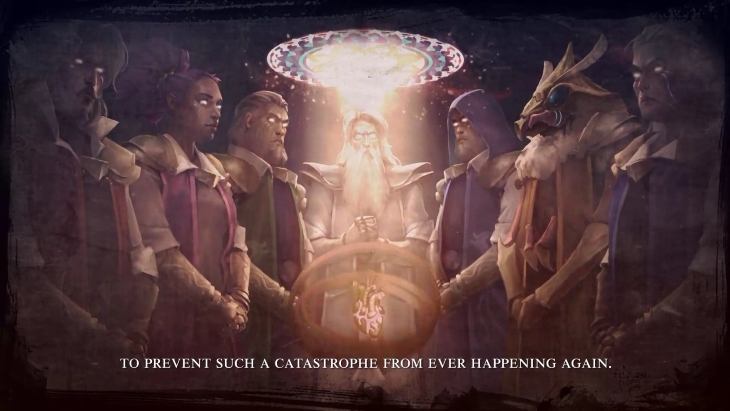 Over time the Arbiters became corrupt- something rather worrying as Arbiters can become an Immortal themselves when one of them steps down. 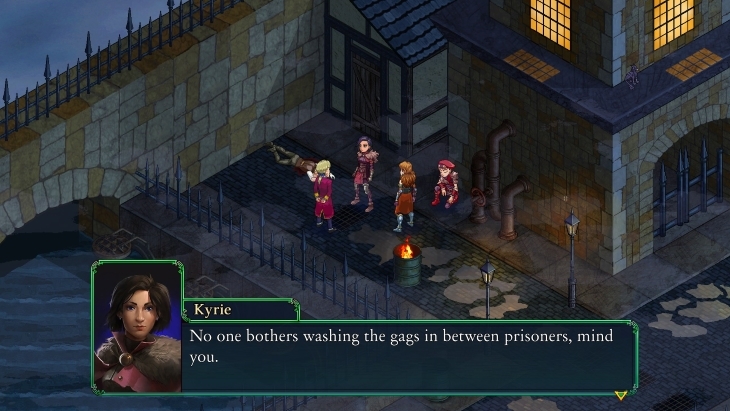 You control Arbiter Kyrie and her friends. 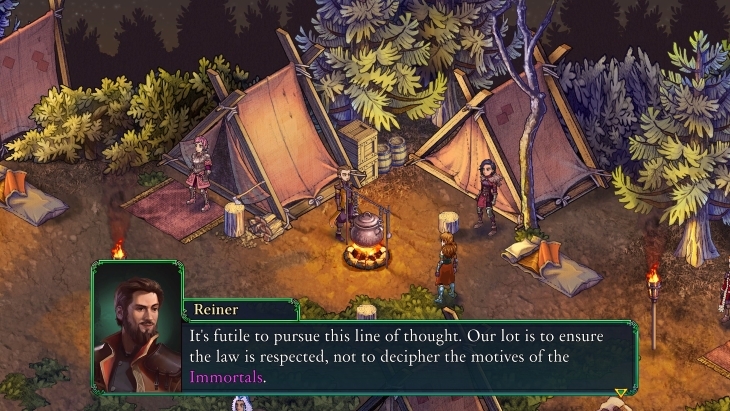 After one of the Immortals declares they have selected someone to take on the Marked Pilgrimage to become their replacement, Kyrie has deep concerns over the candidate and begins to investigate. Matters are made worse by Marked being above the law while on their pilgrimage. The intrigue and conspiracy only spirals out of control from there. The story is excellent, with plenty of twists. It is not just a vehicle for the gameplay, and I find myself restricting what I type to avoid spoiling events that happen within just the first hour. While you can see how some events will play out, I was always engaged. Kyrie’s honor and morals plays off well with how corrupt and unethical the world is. Her solemn attitude does not make her dull however, as she also works off more light-hearted characters like Anadine and Reiner. In turn, these characters also work well in drama, and you can gain optional dialogue to learn more about them. As is typical of these games, the characters you make yourself have no dialogue. Though you can see them in the backgrounds of cutscenes, which is a nice touch to at least make them feel like real people. A serious effort has been made with the story and characters, and this carries over to the game as a whole. 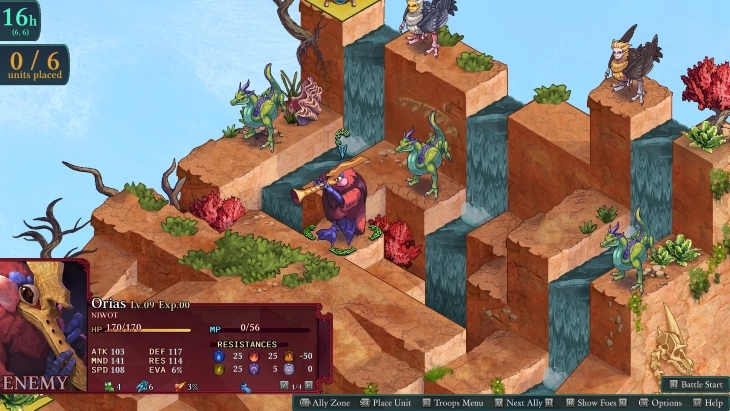 The gameplay will sound familiar if you have played Final Fantasy Tactics or the like. 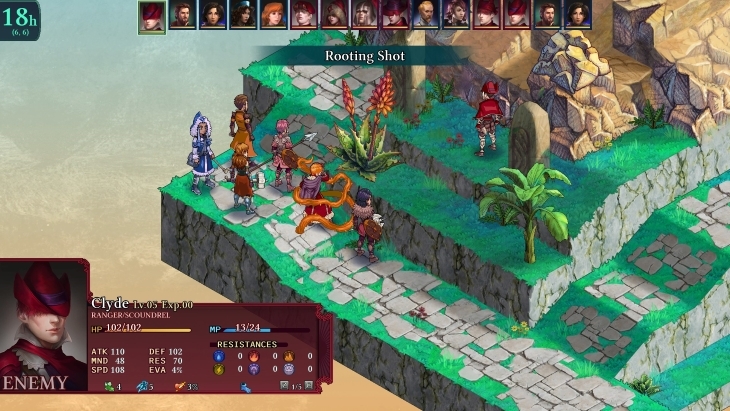 Your party moves around in turn-based combat utilizing a variety of abilities. The abilities you learn are based on your class, and you can use another class’ abilities that you have learned in addition to your current class. So, you could be a mercenary/wizard with access to special attacks and magic. On top of this, you can have up to four passive abilities- two from the class you currently are and two others from any class- and a single counter ability from any class. 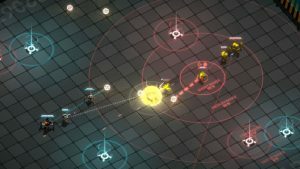 This allows you to develop characters in a huge variety of ways, taking advantage of how the passives and abilities all play off one another. You do not even have to sacrifice the ability to use items if you dual-class. The classes themselves run the usual archetypes of warrior, spell caster, thief and so on. Leveling up in a class (learning their abilities) unlocks other classes. They usually synergize their prerequisites, though one or two class requirements are a bit head scratching. Nearly all of the classes work great, and even those that lack any specialization usually have a great ability to unlock. There are some key differences to games that Fell Blade pays tribute to. While attacks do more damage from the sides or behind, characters do not turn to face their attacker. While this means you cannot expose enemies as easily, it also means they cannot do it to you. I am still on the fence about whether I like this choice, but the game is difficult enough without it. The same applies to only regular attacks being able to cause critical hits, though some abilities alter this (and I swear I got a crit without this). Even the developer’s explanation on why you cannot steal enemy gear made sense. Focusing on getting good gear early took away from the battle, and I can understand. Though in other games this was due to the randomized nature that could lock-off certain items, but I digress. Stealing is now used to gain temporary items and components (the latter can still drop normally). In battle, items are not consumed but have limited usage per battle. Components can be used in crafting to improve the potency and usage of those items can be used, along with creating new gear and even unlocking special classes. Not having to add potions to my shopping list is great, and it prevents players cheesing fights by using their wallet instead of their tactics. The crafting system also works well, although some form of list of what enemies drop what components (once you get the drop once) would be nice- but far from a necessity. New characters can also be hired in towns and can be any class you have unlocked, even if it has prerequisites in other classes. You can also pay to hire a character at higher level- their stats treated as though they had levelled up purely in that class. While it is totally unnecessary to complete the game on regular difficulty, you can even reset a character to level 1 while keeping their learned skills. This is great if you want a specific build and stats, and its inclusion is sure to help those who aim for the hardest difficulty. This combined with how you can tailor a hired character allow for total control of how your party develops. Some main characters do have specialized classes, and it can be annoying to get a new hero who vastly outclasses a similar character you have been developing. Some main characters even gain new classes, which may clash with how you developed them. I never found this myself as I kept melee main characters as melee and so forth. Even so, shifting gears and learning a new class is fairly quick. You earn AP in battle alongside EXP, which can be spent on learning a class’ abilities. Most classes have around ten abilities to master and mastering them all gives that character bonus stats. Fell Seal does something rather unique with how a character masters classes. In other games you would usually have to “dip” into other classes until you got the specific passive you want- meaning you may level up in a class and get stats you did not want. Here characters gain a little AP for the class they are in, even if they were on the bench (at a 50% penalty). Further, any character gaining AP for a class in a battle will cause every other character to gain a little AP in that class (whether they were in battle or not). Along with making leveling up classes a little easier, it also allows you to unlock classes more quickly. 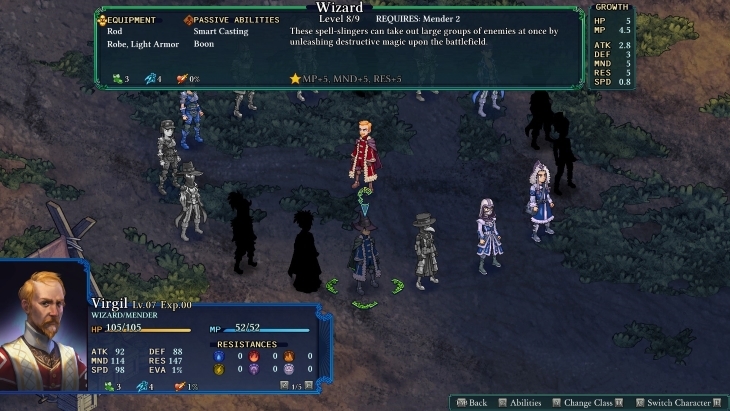 Even newly hired characters will earn all the “Vicarious Experience” for the classes (once they unlock them) as if they were in the party from day one. Since the requirements for a class do not show until you have unlocked all the classes required, you may not even know what you are aiming for. In addition you will not know what abilities a class has until someone can change into that class. It can be a little annoying to start working towards a class only to realize it does not fit the playstyle you had for that character, but by then you are usually half-way to the requirements of another class. Even then, that class can unlock another and so on. This is definitely one of those RPGs you will restart after 40 hours. Then again, the extra abilities never hurt. Maps can also be replayed for grinding, and for components if there is a point to harvest. Some maps even allow you to harvest components directly in battle. Chests you find during story missions are also still available to open when a map is replayed, in case you missed it the first time around. Some chests even require specialized gear to obtain, and maps can have secrets to boot. 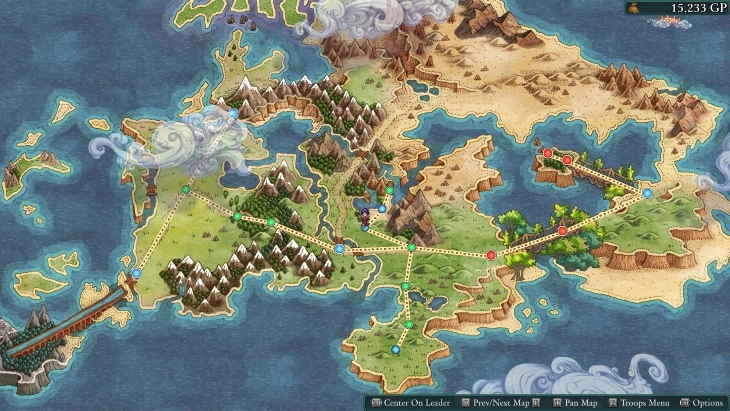 Overall the maps can be quite wide-spread. It can be a tad overwhelming at first; especially since standing back-to-back just invites extra knock-back damage from some of the enemy classes early in the game. 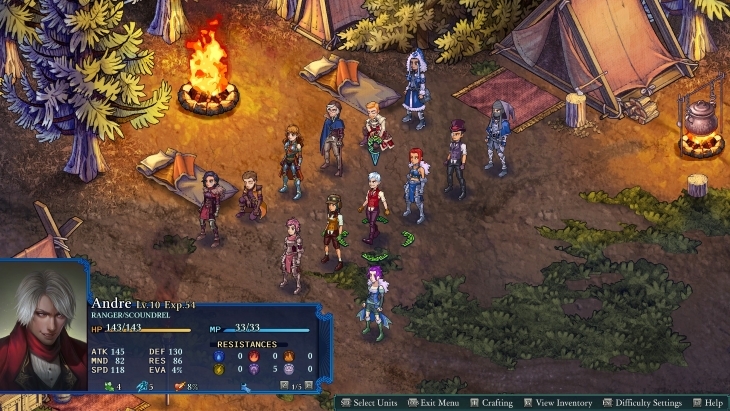 It does not take long to work out where to stand is safe, and you can highlight the enemies’ “movement zone” like in Fire Emblem. There are other mechanics that ease your life as well. The help menu is very succinct and helps explain every status condition and most of the basic mechanics. While the game encourages the use of a controller, the game works just as well with keyboard & mouse, and even lists out what the keys do at the bottom of the screen at all times. Keys can be rebinded, of course. Shops also allow you to “Try & Buy”, letting you equip your whole party with gear and then paying for it after. If you could also equip gear you already own in that screen, it would be the best shop system in any game. 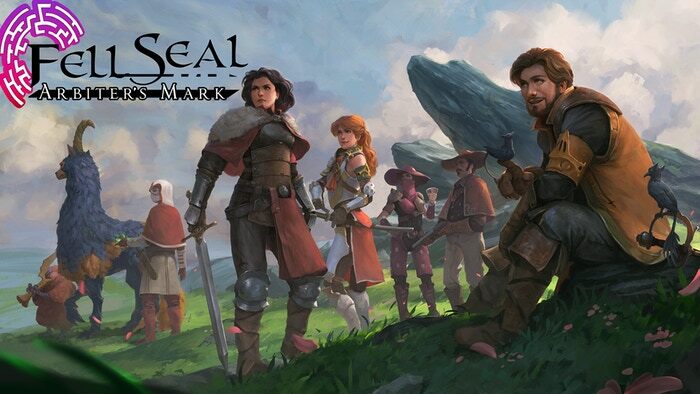 Fell Seal has one of the best difficulty systems I have seen in an RPG. While there are presets for easy to very hard, you can tailor individual mechanics for exactly what you want. This includes enemy level scaling based on your own levels, enemy stats overall, additional enemies, how well armed they are, whether they can revive their allies, and more. Among these include the “Injury” system. By default if a character falls in battle, they will have a penalty to their stats until they miss out on combat to rest up. This can adjusted by being removed entirely, nerfs AP earned instead, injuries being permanent, or five injuries causing a character to die. While Kyrie can never gain an injury, keeping her alive does gain extra AP for everyone. All of the above combined with the burgeoning seeds of a modding community means I am delighted with how Fell Blade has turned out. It understands what was good and bad about its peers and still sought to do some original things. In fact I recommend it over Final Fantasy Tactics and the like, even if you have access to those older titles. Not bad for an indie dev’s first game, right? The game’s graphical style looks fantastic. All three of them. I can understand the character sprites taking on a pixilated and anime look due to what other games in its sub-genre look like. It does seem odd when combined with sharp drawn maps and a slightly more realistic painting style for the character portraits. The latter of which is closer to the game’s opening movie and title screen. For those familiar with how you can change the art-style in Stranger in Sword City between a more realistic style and full-blown anime, it is like that with both at once. While mixed art-styles sound like condemnation, I grew to accept it and it never took me out of the moment. I took more issue with a river on one map that had rolling waves drawn in chalk than the shift between sprites and portraits. 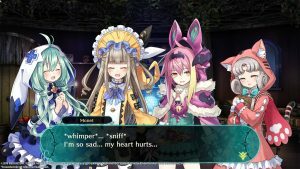 The semi-chibi sprites also offer a surprising amount of emotion on such simple images. Giant eyes aside, the animations during cutscenes allow for slight changes in pose that tell a lot. I thought characters standing almost bolt-straight and un-dynamic in combat would drive me mad, yet it did not. I did get used to most animations only using a few frames, but others may feel it needs something more. The same applies to magic and special skills. While they certainly look impressive at higher levels with swords of ice crashing down and hands of fire clapping around your foes, the lack of particle effects, lighting changes and and other visual effects can make them lose some impact. Most special attacks still involve the character making a basic swipe while other effects go off. There is a surprisingly large number of customization options for characters you create. 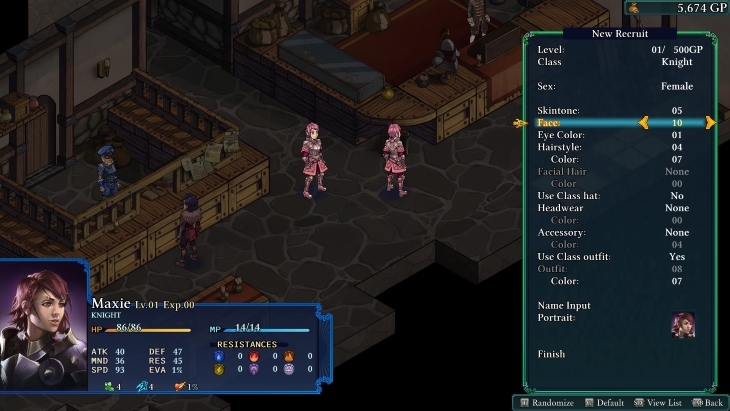 Along with 40 + portraits for each character, you can change the characters clothes to nearly any class and then some. You also have access to a wide variety of accessories, hair, and a few faces. Plus you can click on any category to view the whole gallery of options available to you instead of scrolling. One thing that bothers me (and I suspect only me) is that on rare occasion I could not create a character that matched a portrait. While minor details can be ignored, there are some hats in portraits you do not have and some clothes and colors that do not fit any portrait. I do not expect a portrait for every combination of features but I am surprised I cannot make characters based on all portraits. As I said, I feel it only bothers me. But if it also bothers you, good news! The game also offers the ability to import your own custom portraits (via the documents folder). It is a great piece of customization, and I hope the modding community opens up more options for other parts. The game also has the graphical option to be “pixel perfect” on smaller resolution monitors. If the vertical resolution is less than 1050px, the camera zooms in so the pixels are not scaled down. This is optional, and is a nice touch to make sure the game still looks good. The excellent looking non-human enemies go beyond the typical fantasy fair of goblins and orcs, and it does well for it. I looked forward to fighting monsters more than I did humans. Not to say human enemies look bad, they dress in the default clothes of their class and have a variety of faces to set them apart. Despite my complaints, everything looks great in Fell Blade. There are a few things that could be done to improve the presentation, but they are in no way necessary. In fact the game has done well to look so good without using the usual flares AAA heavily rely on. The game’s soundtrack is also top-notch. A sweeping (simulated) orchestra that would fit right into a number of major fantasy RPG franchises. You get geared up for battles and invested into the story a lot more thanks to it. In addition, the game uses a number of battle tracks so I did not find myself getting bored by them. Even then, singular tracks never grew annoying or repetitive. There is no voice acting, which is better than bad voice acting of course. Though you do not get any “barks” for when characters attack or are attacked except when someone dies. The sound effects for most attacks sound pretty meaty. It certainly helps sell what the animation almost could not. I remember thinking how lethal the maul sounded, despite only using a few frames of animation. In fact, that seems to be a theme for the whole review. 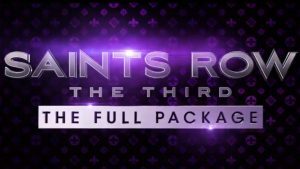 I can only imagine what the team could have done with a limitless budget. Even then, I do not find myself hating any aspect of it. 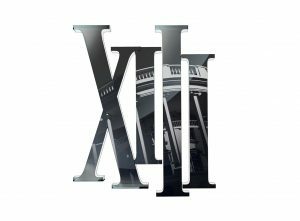 Any time I found myself comparing it to similar games, any advantage it had was subjective or purely because of a bigger budget. 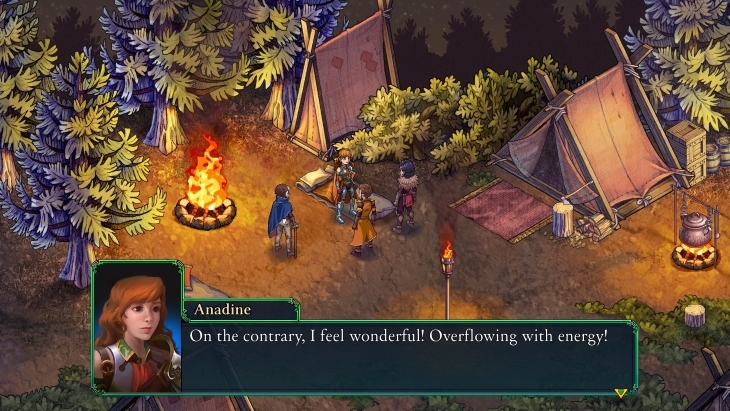 Fell Seal: Arbiter’s Mark has earned the high praise I give it. Nearly every criticism I have towards it is a nit-pick, or comes down to personal taste. This is exactly what I have been looking for, and I think fans of this sub-genre will be to. It practically fell from heaven. 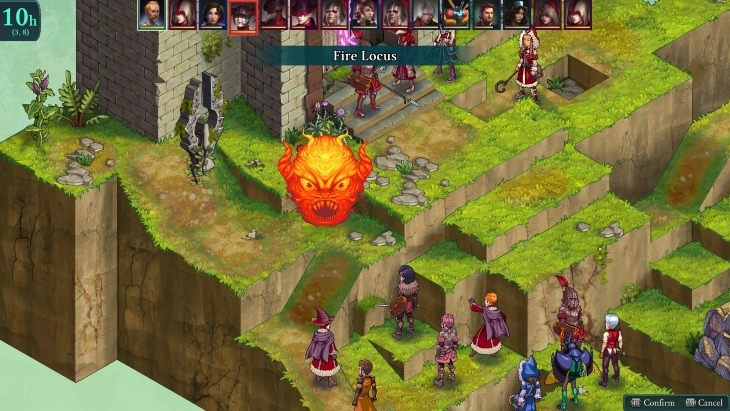 Fell Seal: Arbiter’s Mark was reviewed on Windows PC using a review copy provided by 1C Entertainment. You can find additional information about Niche Gamer’s review/ethics policy here.